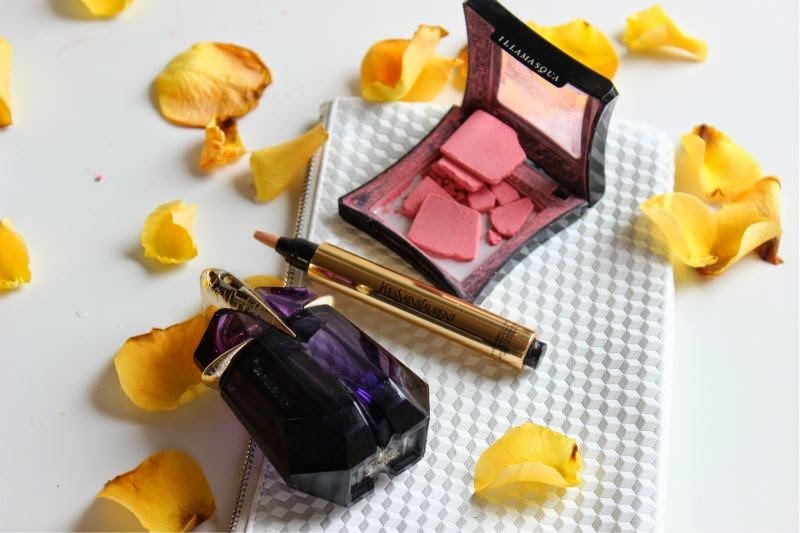 I don't always gush about the following products because let's be honest that would get old and tired quick but today I thought it would be a good idea to share the products I forever have on repeat. 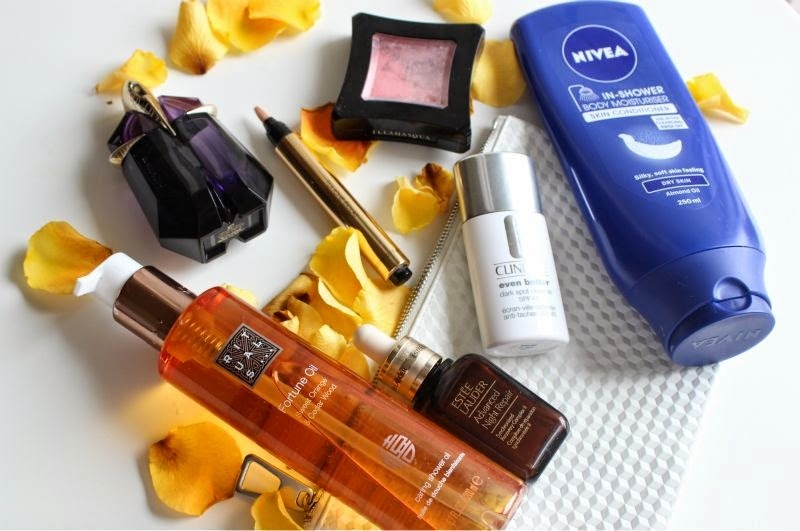 The products that once I begin to run low on I instantly repurchase. I'm not the biggest fan of body lotion or body butters, sure they leave my skin silky soft but standing starkers waiting on the lotion to absorb is something I'd rather forgo. I don't have the driest of skins so I use a combination of Rituals Fortune Oil Caring Shower Oil and Nivea In Shower Body Moisturiser. Alone I guess they aren't the most hydrating of products but combined it just works. Lazy? Yep that's me! Clinique Even Better Dark Spot Defense entered my life and basically changed how I look at facial sun screens forever (and ever). It is just so light yet offers an SPF of 45, it will shield the skin from both UVA/UVB rays, pollution as well as instantly brightening the skin. For me the main reason why I hold it in such high regard is that is does not feel heavy or sticky on the skin, it doesn't leave a white cast and won't interfere with any make-up layered on top. It can also help to reduce dark spots on the skin with continued use - I can't possibly comment on that aspect but I do use it on hands as a precaution. To know me is to know I am obsessed with my hands and eyes ageing! 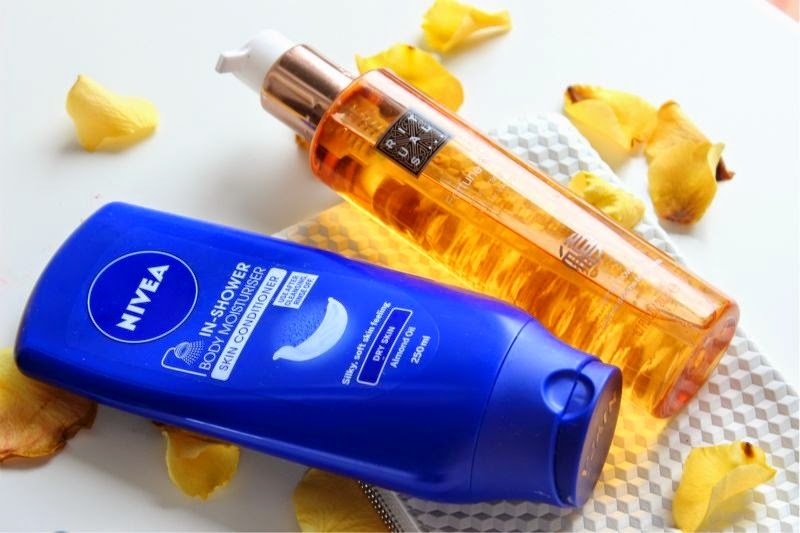 As I am a beauty blogger I am not all that loyal to skin care, yes I use it daily but I am forever on the look out for the next best thing (aren't we all? ), yet I have two items I can not be without. 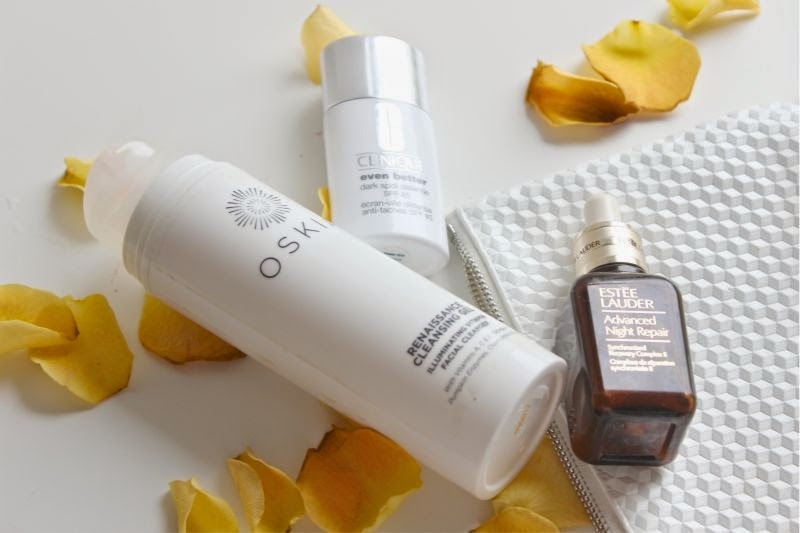 My favourite cleanser is Oskia Renaissance Cleansing Gel, a gentle yet effective cleanser that melts off ALL of my make-up, feels great on the skin and can be relied on even when I am breaking out. It contains vitamins a,c and e as well as Omega 6 to brighten the skin. It also contains Pumpkin Enzymes to gently exfoliate the skin. All I know is that since becoming loyal to this cleanser my skin has never looked better, my pores are clearer and my skin tone more even and bright. At £28 it isn't the cheapest cleanser but my gosh does one bottle last forever. I also swear by Estee Lauder's Advanced Night Repair II, I'm not going to bog you down with all the science (that's what this review is for -link) all you need to know is that without this my skin is dull and lack lustre. Think of it as a good nights sleep in a bottle. It pains me that it is pretty expensive (the smallest bottle costs £48) as I do tend to over apply. Speaking of a good nights sleep I also swear by YSL's Touche Eclat, I was a little late to the party as far as this undereye brighter goes. It was one of those products I promised myself I'd try out one day but never got round to doing so until earlier this year. Although this does have some concealing properties I tend to use it as a brush on liquid highlighter and on occasion as an eyeshadow primer. I'm now on my second pen of this gloriously creamy formulation and do tend to use it daily to disguise the fact that I don't sleep all that well. It layers well over concealer and foundation and doesn't have a tendency to crease. In a word? Love! Along with MAC Angel Lipstick (I have a new tube on the way, like a silly goose I left my current one in the car, on a rather warm day. Yeah mush is the best word to describe it's current state), the only other pink make-up staple of mine is Illamasqua's Tremble Blush. Look at the state of mine, I dropped it in a hotel and it shattered. Wah! The good news is that I can still use it, the bad news is that I can't take it on my travels. Anyway this bright, pink coral blush is a must have for all skin tones, it is matte yet lifts and brightens the skin. I promise you won't regret purchasing it. I have yet to find someone this shade doesn't suit. Lastly we have Theirry Mugler Alien Eau de Parfum, I have worn this for years and I mean years. It first launched in 2005, I got my first bottle that Christmas and have worn it ever since. I like the idea that it is my signature scent and that should anyone I know or have known in the past catch a whiff of it they are reminded of me. Oh vanity you cruel mistress. Do you have any products that you truly can not be without?